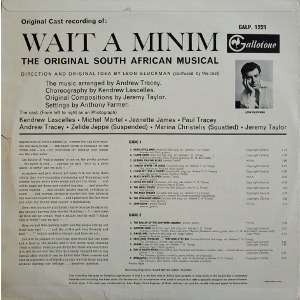 Original Cast recording of: WAIT A MINIM the ORIGINAL SOUTH AFRICAN MUSICAL. original compositions by JEREMY TAYLOR. The cast includes PAUL & ANDREW TRACEY. 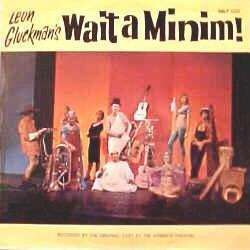 The song list includes "The Ballad of the Southern Suburbs", which is better known as "Ag pleez Daddy", performed by JEREMY TAYLOR. The record is in excellent condition, apart from a few light surface scuffs. The cover is in an unusually, for this South African item, rare very good condition, apart from a little longer than 1cm tear at the bottom & some creasing at the bottom right corner. 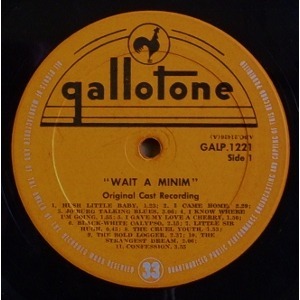 SIDE TWO has 7 tracks, including: Hammer Song / Deutsches Weinlied...Watschplattltanz / This is South Africa / Amasalela.